Duterte declares September 21, 2017 a "national day of protest"
MANILA, Philippines - President Rodrigo Duterte announced on Monday that September 21, 2017 (Thursday) is not a holiday but a "national day of protest." Duterte added he would suspend government work and classes during that day. September 21, 2017, Thursday, marks the 45th anniversary of the declaration of martial law by the late President Marcos. 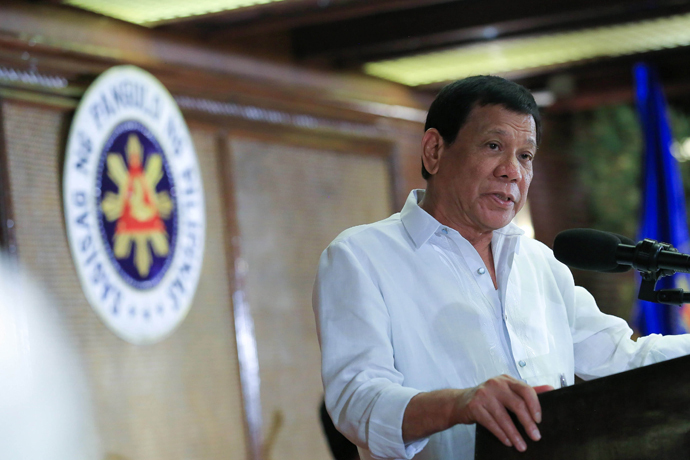 In his interview over state-run PTV-4 on Thursday, the president said his intention to declare holiday in time for the Martial Law celebration. "If it's a massive demonstration, at this early, I am announcing that I am ordering a holiday para walang masaktan. Walang trabaho ang gobyerno at classes suspended," Duterte said. Defense Secretary Delfin Lorenzana also told the press about Duterte's plan to suspend work and classes. “During my interaction with him early this week, sinabi niya na pagka magkaroon ng massive rallies sa Metro Manila and it might inconvenience the public, para hindi ma-inconvenience, sinabi niya, ‘di ko na lang sila papasukin," Lorenzana said. “[He] will declare na wala nang papasok sa mga opisina so they will have a free hand kung anong gagawin nila sa mga demonstration nila. That’s what he said,” he added.